As a veterinary surgeon I have a privilege that my medical colleagues do not have. In certain situations, in an effort to alleviate suffering, I have a treatment option of euthanasia.This option is not taken lightly but is used to the patient's advantage to avoid further suffering in an already hopeless situation. Unfortunately, throughout the summer months, that option will be used repeatedly when confronted with rabbits who are suffering from advanced flystrike. I doubt there would be few people who would argue that this unfortunate patient would welcome an end to his suffering. 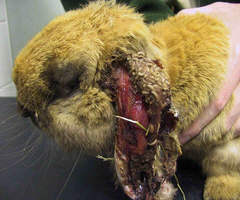 Flystrike or myiasis is an extremely well recognised problem in the UK amongst pet rabbits. It most commonly occurs around the rump and perianal area where blowflies are attracted to faecal deposits. Inappropriate diet, poor dentition and damp living conditions can contribute. Making the problem more likely as soft faeces attract more blowflies. Blow fly eggs hatch into maggots. These larvae then produce enzymes which can digest proteins in the skin causing extensive damage and necrosis. A variety of different products such as "Rearguard" are available to help to minimise this debilitating and quite horrific condition although nothing is as useful as examining your rabbit on a daily basis. There are few things more disturbing to see than maggots munching their way through living flesh and if the image above can help to highlight this perennial problem and save other pets becoming affected then it is worthwhile publishing. The Fairfield Veterinary Centre are currently involved in a national project aimed at a better understanding of the species of flies involved and the pathophysiology of the disease. In doing so we hope to be better able to advise on how to to avoid and treat this unsavoury condition.